ThemeParkMama: 2 New Products from Hard Candy! 2 New Products from Hard Candy! Enhance your eyes and create a dramatic look with the new Hard Candy Stroke of Gorgeous Kajal Supreme Eye Liner Duo. This dual ended liner equips you with both a soft kajal eye liner and an ultra black long wearing liner for just $6. This new supreme formula offers everything needed to achieve a perfect eye makeup look in seconds. 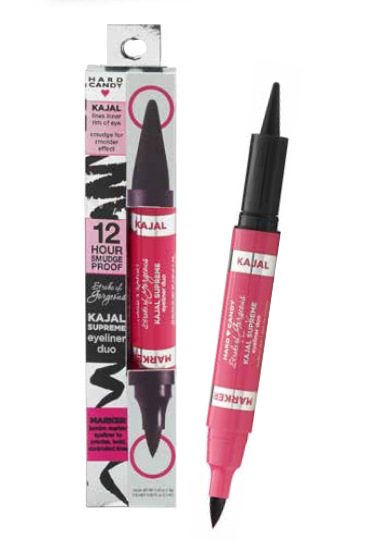 The Hard Candy Stroke of Gorgeous Kajal Supreme Eyeliner Duo is available at Walmart and Walmart.com. Hard Candy Turn Me Matte Glamoflauge Mix-In Drops are concentrated liquid drops that can be used to change the finish of your liquid and cream makeup to matte. Simply mix several drops of the transformer into your liquid or cream foundation and then apply the mixture to skin as you normally would. Even the dewiest foundations will instantly transform to a matte finish without compromising the look or feel of your foundation. The mattifying drops reduce shininess on the face, especially in the T-Zone, absorb excess oil and sebum, and minimize and blur pores to create a matte complexion. Skin will be more blurred, with pores becoming less visible. Turn Me Matte drops can also be used throughout the day to absorb oil buildup and refresh your makeup. The Hard Candy Turn Me Matte Glamoflauge Mix-In Drops are available at Walmart and Walmart.com. Paqui Gourmet Tortilla Chips Oh So Yummy! Carmex Comfort Care Lip Balm! Sydney Paige Backpack the ones which give back! Got Funk? Lose it with Funkaway! Teddy Soft Bakes, a great treat for on the go!